Chandeliers can take any room from simple and casual to being the most dramatic room in the house! 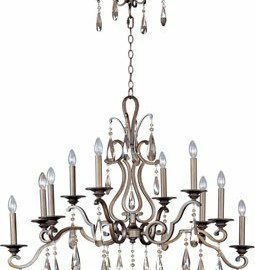 Whether you want to take an already decorated room and add some pizzazz to it, or are starting from scratch and decorating a room in efforts to make it dramatic, chandeliers are the way to go. • Kitchen – A fun chandelier in your kitchen’s style placed over the kitchen table is perfect for style and lighting. • Bathroom – Add a small chandelier that fits the space (no matter how small) but also pumps up the drama! Think bright, sparkly or quirky. The bathroom is a great space to have fun and go for something outside the box. • Dining Room – The dining room is the most common room to install a chandelier because it is typically the most formal room in a home. Stick with your home’s style when choosing your dining room chandelier, but remember to go bold and pick something that will make a statement. • Bedroom – A chandelier can be installed over the bed, or over any reading/desk area your bedroom may have. A chandelier will take any ordinary reading/desk area to the next level by increasing the drama and adding some useful lighting as well. • Laundry room – Not the most common space to add a chandelier, but the laundry room is often forgotten; by adding a small chandelier you can create drama in a room where drama is most likely lacking. By adding an unexpected chandelier into a typically casual space such as the bedroom or laundry room, you can ensure that guests will be impressed by your home’s style and décor! On the other hand, by adding a spectacular chandelier into formal yet drab room such as the dining room, you can up the style of both that room, and the surrounding rooms! Chandeliers are one of the best additions for any homeowner that is looking to make an impact change without making tons of little changes around their living space.